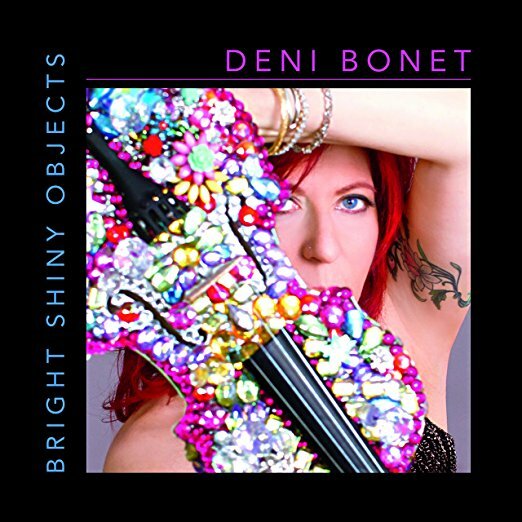 Album Review: Deni Bonet, "Bright Shiny Objects"
As I mentioned when premiering the below video for the title track of Bright Shiny Objects, for any artist, the idea is to grow and show a scope, broader and more expansive than what the listener should expect. So it should be no surprise to anyone that with Bright Shiny Objects, Deni Bonet has taken her musician’s skills to an even higher plane. The key to this new album is that Deni refrains from singing – this is her first all-instrumental rock album. And make no mistake – “rock” it indeed does. Loud and hard. But the key to all of this is the melody and the power – the emotional peaks and valleys of the music. The playing is so damn rich and fine and tempered and textured; the melodies are strong and enveloping and damn it, I can hear it in so many places (close your eyes and you can vividly see some of the images that will arise). “Light This Candle” starts the album as a perfect call to arms – gathering the listeners to sit down, open their minds and ears and let this music in; a sweet and buoyant track – you don’t need to see or hear lyrics to know that “hope” is the theme to this piece; “Raise The Roof” is some get down, heavy Southern-inspired boogie, with its feel and rhythm; chugging rhythm and sweeping lines (and listen to that very subtle but exquisite acoustic guitar underneath it) and the hypnotic riff that propels “Einstein’s Brain” is just that – hypnotic and delightfully crashing rock on what would be the choruses; the circular nature of the track spins, stops and starts all over again in a perfect sequence. “Primal Dream” starts with a warm, deep acoustic guitar and meshes perfectly with the mournful opening lines from Ms. Bonet’s violin but the tune brightens once the band kicks in and then starts to rock with the virtuoso firepower in the soloing; “Palisades” is again, led in by a soft touch on acoustic guitar and a dramatic but not dark violin entry – the playing builds up as the song ebbs and flows and know how to reach that certain emotional height that I mentioned previously and it shines and “Magic Wand” has a wonderful immediate warmth with its adventurous tone and very tight interwoven play of all the instruments. Thirteen tracks is a treasure trove to be drawn into and that’s an understatement. Deni Bonet’s playing – and the compositional structure of these songs – does exactly what I said it would do. It takes you in and wraps you up without even realizing you won’t be hearing anyone singing. The emotion and power of the playing is the everything; it’s the key. And on this album, Deni Bonet has opened the door for all of us.